The macabre and twisted tale that sees Lucifer Morningstar, powerless, wandering through, a purgatory continues in Lucifer #3. The parallel story of Detective John Decker struggling with the death of his wife takes a strange new turn in this issue. 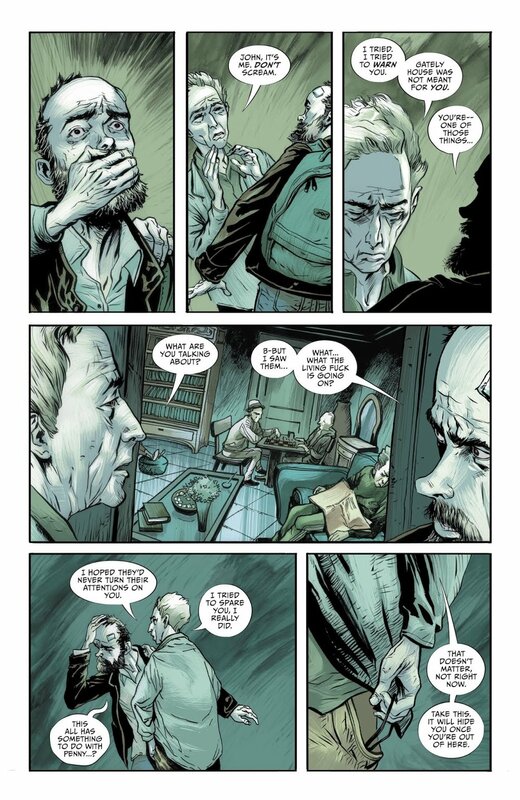 The engrossing story is written by Dan Watters, with illustrations by Sebastian Fiumara and Max Fiumara, colors by Dave McCaig, and letters by Steve Wands. Previously, Detective Decker had attempted to reach out to his late wife’s cousin, but the trip, and conversation, didn’t shed light on the secrets his wife had been keeping from him or why she kept them. As he trekked through the rather off-putting house, most of its contents and residents utterly confused him. Meanwhile, in an unknown prison, Lucifer made a great discovery with his shovel, but an unfortunate setback befell the once Ruler of Hell. Now Lucifer, impatient and rueful, recovers from his wounds. While another purgatory resident, William Blake, offers to entertain the fallen Morningstar time with a story from his life; revealing how he once wrote about and wrought the drudges of the underworld. Detective Decker returns to the Gately House only to overhear that he may be a secret piece in the game it’s bizarre guests are playing. Dan Watters explores the history of members of this eccentric purgatory, while showing how, at one point in time, most of those trapped there have crossed paths with Lucifer himself. 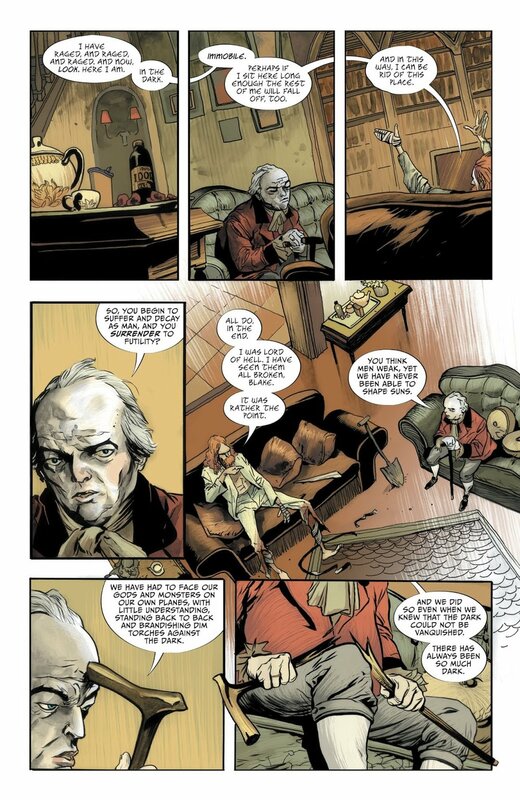 Watters continues to tell multiple character focused stories in each issue, canvassing many different moments throughout Lucifer’s life and how every character involved has some connection with the Morningstar. The tale, and cast, continue to grow as it plods down its morbid road. The illustrations by Max Fiumara and Sebastian Fiumara depict the grizzly horrors of what Lucifer could bring about, in a story encompassing him, in a wonderfully ghastly manner. The colors provided by Dave McCaig remain somber and powerful, helping the art to convey just as much of the story as the narration and dialogue. Lucifer issue #3 weaves together stories from the point of view of multiple characters, building them up through the telling of their own life story. It’s gripping to see how they’ve all come in contact with the King of Hell before, and what they may present to him now that he isn’t the all-powerful being he once was. As number of relevant characters become more prominent and the disturbing sorrow slowly rises around John Decker. Lucifer keeps your teeth sunk into its issues, and your mind craving the answers to the questions it has brewing.